I'm typically an after work workout kind of gal. Getting up early in the morning (well, earlier than my 5:30 a.m. wakeup call) just is not my thing. If it's not yours either, let's be friends. While I don't want to run a 5K before getting ready for the day, I do need a little something to kickstart my morning. 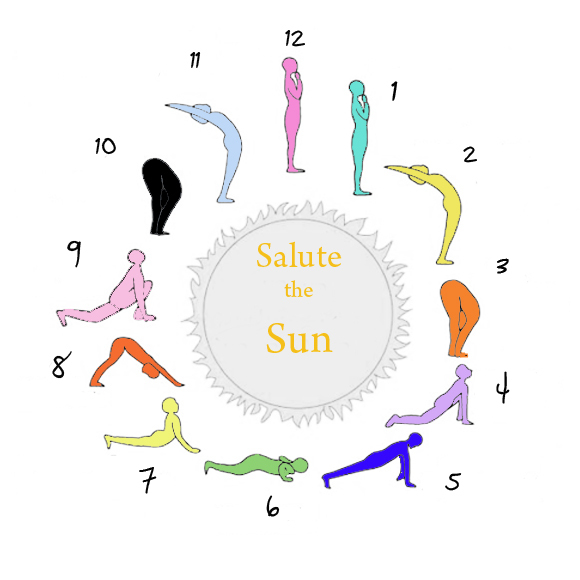 And with my newfound love of yoga, I have just the exercise - sun salutations. While I do sun salutations during every yoga class, it never occurred to me to do them in the morning as soon as I woke up. Thank goodness I stumbled across this article on Free People Blog. Such a great graphic and information. I just had to share! Sun salutations are poses in which you literally salute the sun. The 12 poses will help you start your day strong with a clear mind. Do the below 12 poses, linking them together to create a series. Repeat five times, and begin your day! Below are the 12 poses and their descriptions (thanks to Free People.) Have a great day, loves!